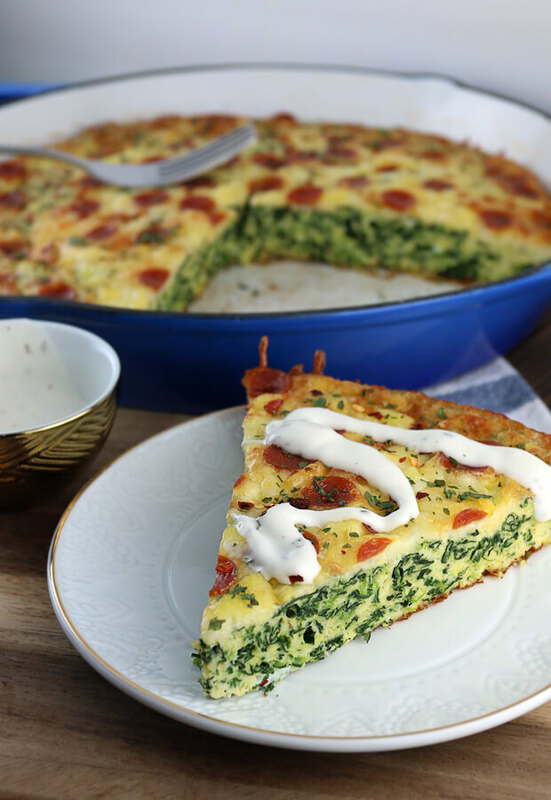 Frittatas are a fantastic food to make when you’re meal prepping or have little time in the morning to wait for breakfast to cook. They’re great microwaved, re-heated in the oven, or just plain cold (which is my favorite). 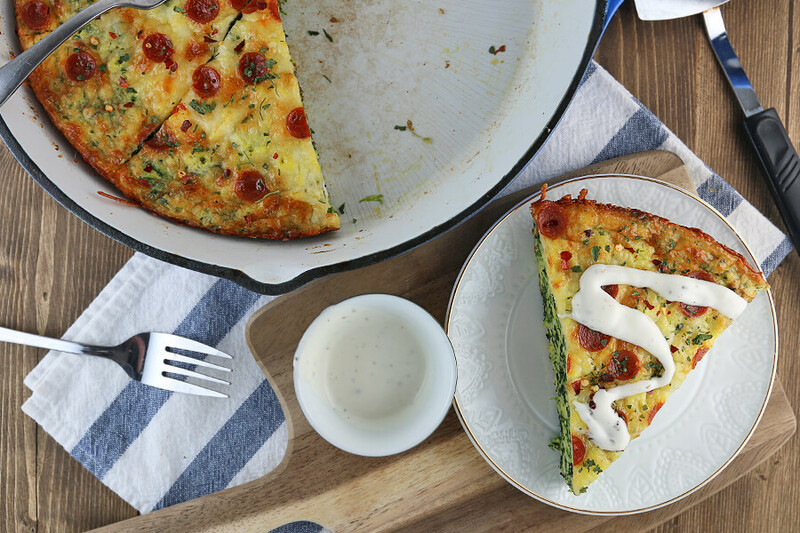 Today we’re going to make a ketogenic friendly white pizza frittata. Traditionally, a white pizza is the dough and cheese on top (in a nutshell). 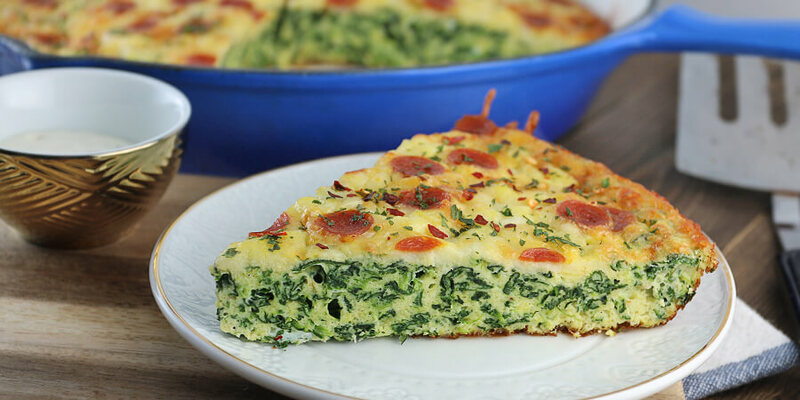 Instead, we use different cheeses in the frittata base, and top with a delicious mozzarella and pepperoni combo. Inside is the perfect amount of spinach for every bite to make sure we get some greens in. The texture is a bit more on the dense side for a frittata, because of the melted ricotta and parmesan cheese inside. With the extra mozzarella on top, it really is a great bite. You can dress this up exactly how you want, too! If you want to add sausage, peppers, a little bit of onion – just mix it in with the eggs and be on your way. You can also add some fat to the toppings if you’d like – dip in your favorite ranch sauce, add a bit of hot sauce, or even spread a little bit of sriracha mayo on top. The choices are endless! On a side note, I wanted to mention that I’m using a cast iron skillet for this recipe. You can easily prepare this in a glass baking dish, but you will need to bake for a little bit longer (around 40 minutes). Make sure that it’s set properly if you’re using a glass dish (since cast irons will retain a lot more heat during the cooking process). 1. Microwave frozen spinach for about 3-4 minutes, or until defrosted (but not hot). Squeeze the spinach with your hands and drain of as much water as you can. Set aside. 2. Pre-heat oven to 375F. Mix together all of the eggs, olive oil, and spices. Whisk well until everything is combined. 3. 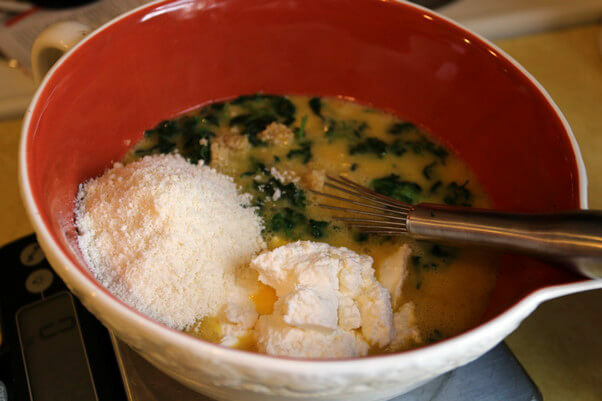 Add in the ricotta cheese, parmesan cheese, and spinach. 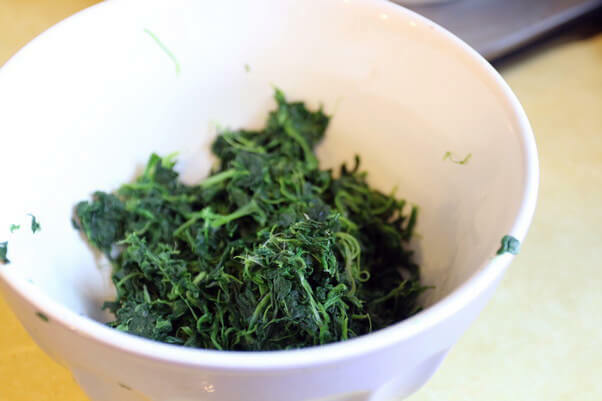 When adding the spinach, break it apart into small pieces with your hands. 4. 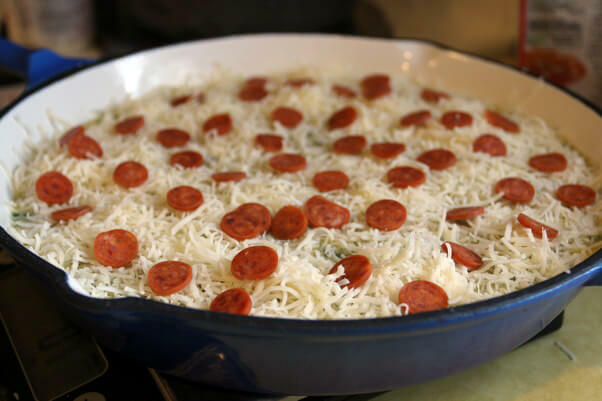 Pour the mixture into a cast iron skillet, then sprinkle mozzarella cheese over the top. Add pepperoni on top of that. 5. Bake for 30 minutes. If you’re using a glass container (instead of a cast iron), bake for 40-45 minutes or until completely set. 6. Slice and enjoy! Top with creme fraiche, ranch dressing, or your favorite fatty sauce on top if you’d like. Microwave frozen spinach for 3-4 minutes. Squeeze the spinach with your hands and drain of as much water as you can. Set aside. Pre-heat oven to 375F. 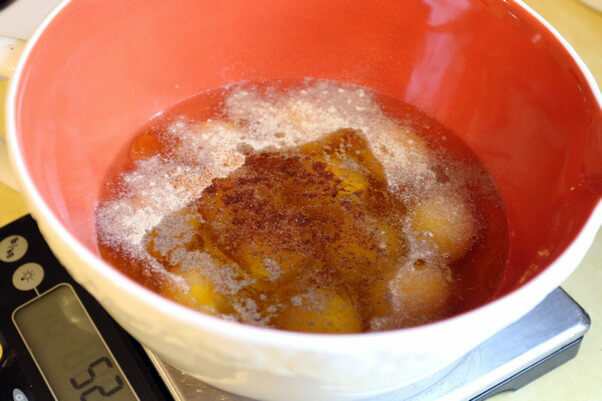 Mix together all of the eggs, olive oil, and spices. Add in the ricotta, parmesan, and spinach. When adding the spinach, break it apart into small pieces. 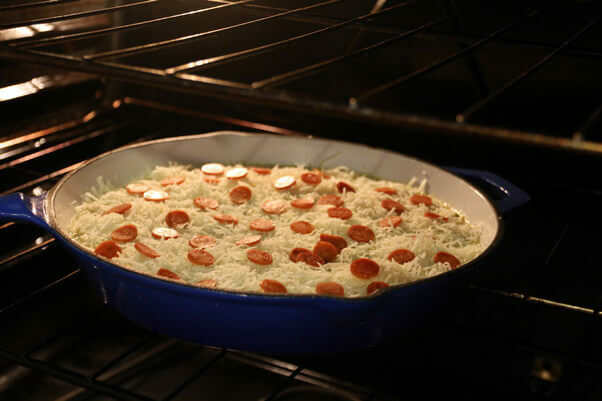 Pour the mixture into a cast iron skillet, then sprinkle mozzarella cheese over the top. Add pepperoni on top of that. Bake for 30 minutes. Remove from the oven, slice, and serve!